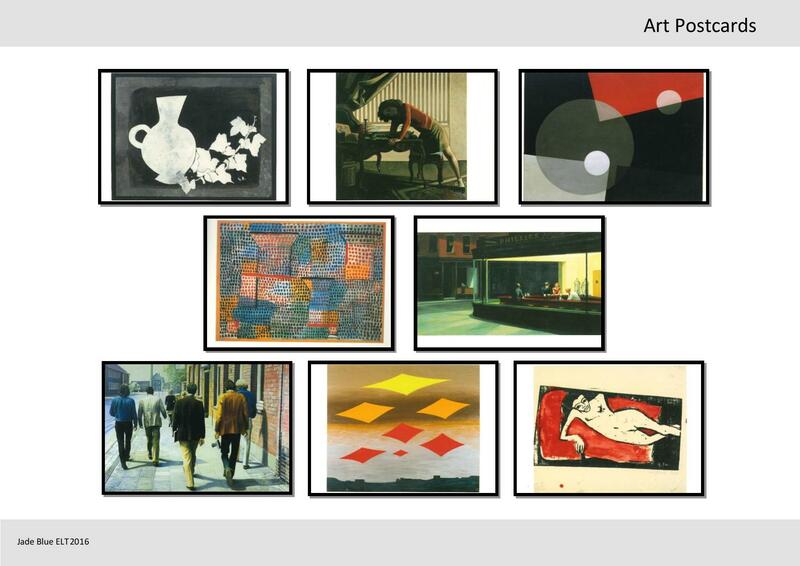 So today I started messing about with designing another worksheet – this time using a set of images (art postcards) as the ‘text’. This is based on a lesson I’ve done a few times before, but it’s always been fairly improvised. The process of creating the worksheet has felt like it’s focused the lesson a little more, and it really struck me how intertwined the materials and the plan can be – to the extent that if need be we can pick up a book and walk into a cover class at a minutes notice (which, incidentally, is precisely what happened on my first ever day in the classroom, and I have to say, there’s a lot to be said for diving in at the deep end). 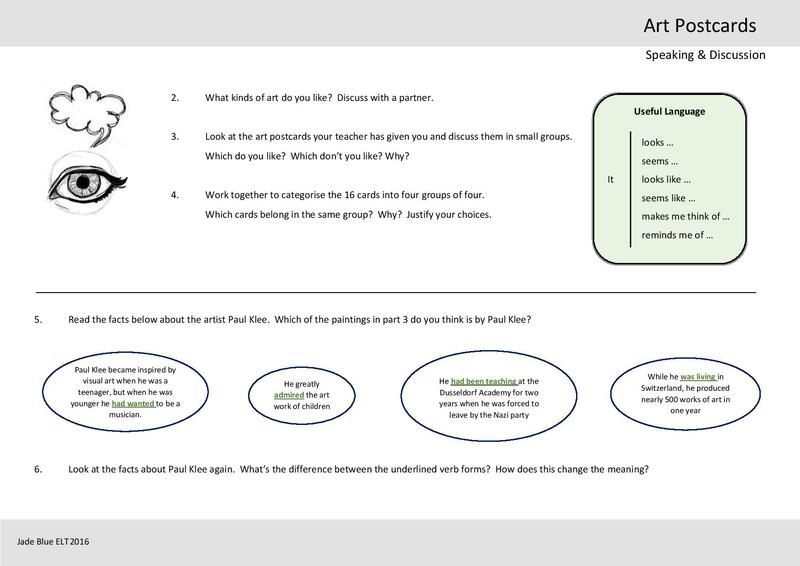 Here’s the worksheet – the first two pages are a collection of the images I use in the lesson, basically for the reader’s benefit, because rather than a handout, I like to use actual postcards which learners can then pick up, move around, categorise, etc. The artist is referenced on the back of each card. In terms of actual content (as opposed to design/layout), the really new bit here is the Paul Klee sentences. It was in putting together the grammar reference page that it struck me how disjointed it was – which interestingly it hasn’t felt in the classroom when it’s been more improvisational. So I felt a segue was necessary between discussions about the paintings and the grammar reference. I don’t think it’s quite right yet though. The grammar reference page took awhile, and I kept thinking how much quicker it would’ve been to do by hand, but I appreciate that it looks more professional this way. When I’ve done this lesson before, I’ve elicited the grammar stuff to the whiteboard. It seems more fluid and involving of the learners that way, so the worksheet feels like it might somehow constrain that part if I were to follow it to the letter. Which I won’t. The worksheet provides a take-away reference for learners, but it’s vital to remember that a good lesson is largely about what we do with the materials. I’m using Ian McGrath’s summary of Alan Maley’s taxonomy of procedures for use with raw texts. Given that the text is an image, it’ll be interesting to see what my reflection using this typology reveals… so here goes! Yes: brainstorming, arrows to match grammar components, and writing (although that’ll be done on a separate piece of paper. Oh my, yes. Image to story. Grammar includes matching, the ‘text’ not so much. 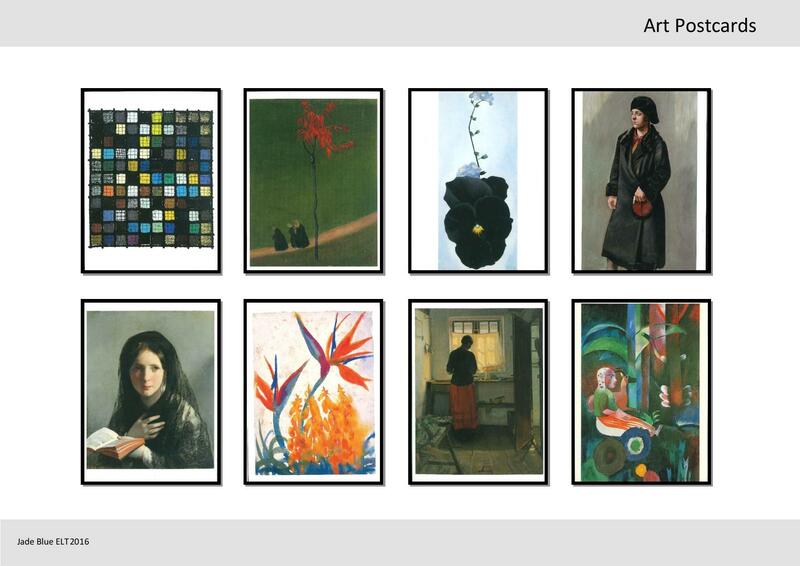 Yes – categorising postcards into groups and selecting three for the basis of a story. No, unless you count identifying the pictures in stage 9. No, but in the past I’ve extended in this way with learners identifying forms and patterns in each others’ texts. Something I didn’t feel would quite work on a worksheet. Hmmm, kinda but not really. It’s really interesting to observe how a lesson that’s previously been so organic can start to feel restricted by a worksheet. Is that because of the instructions? I don’t ordinarily include instructions on my worksheets, why am I doing it here? Maybe because I want the worksheet to speak for itself – but that’s for teachers, not learners. So who am I creating for? I’m reiterating what I said above, but vital to remember that throwing parts away is as important as bringing stuff in. 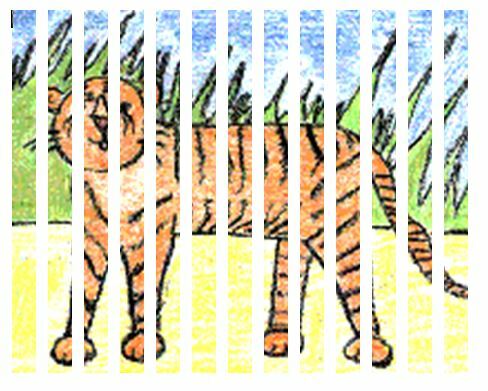 It’s the space between the bars that holds the tiger. Lovely worksheet! It is well-structured, engaging, coherent, and the students are stimulated both linguistically and cognitively. I think that your use of the visuals as stimuli and inputs for the whole lesson is brilliant. I agree that the part on Klee might seem a bit disjointed from the rest of the lesson. However, I believe that it would very much depend on how the teacher manages that part of the lesson. For example, she might start by asking the students who their favourite painters are and then she can talk about her “favourite” painter (i.e. Klee) maybe using the marker sentences that are given for the grammar focus. 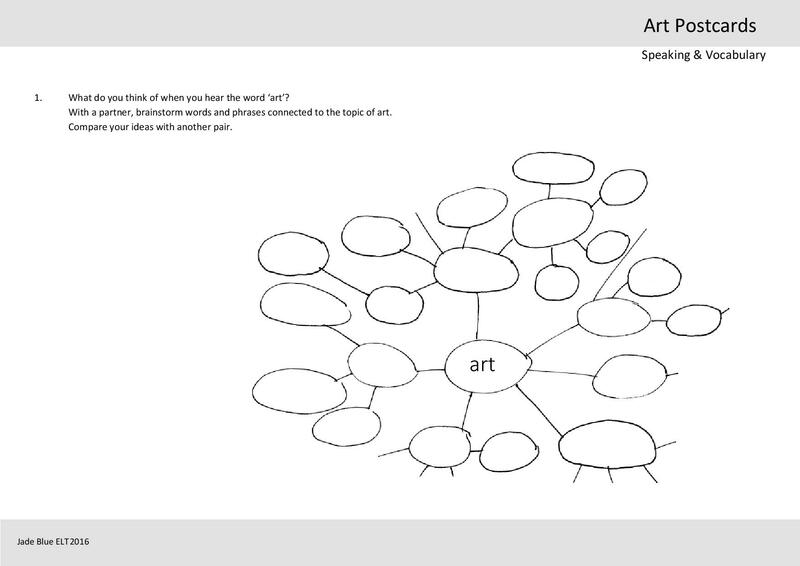 I like the idea of proving the students with a ready-to-use mind map at the beginning, but I’m wondering if it would be better to leave them the choice on how to draw it. As for the grammar focus part, I think that it is challenging, engaging and clear. The only thing that I personally find slightly confusing are the timelines. I was wondering if it would be better to use the same greenish colour that you have used to highlight the verb form in the marker sentences for the actions/events that they refer to on the timeline. 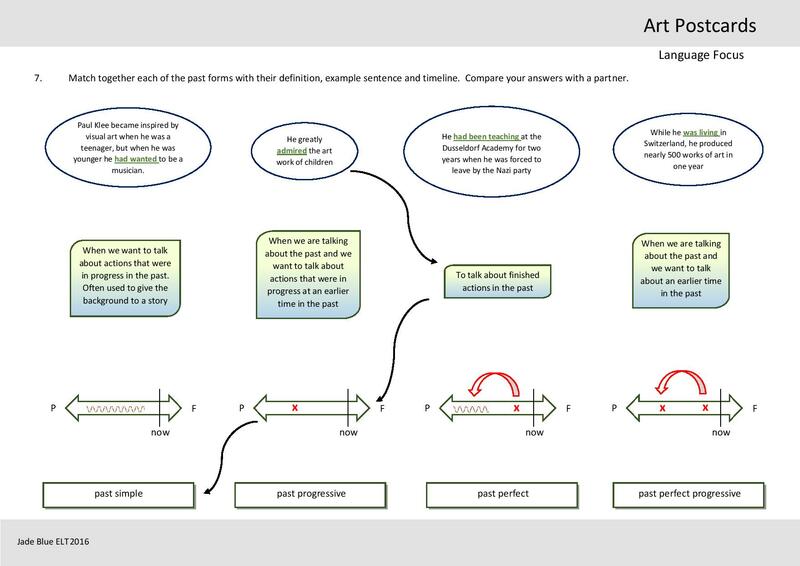 For example, on the timeline where you highlight the use of Past Perfect, I would leave the Past Simple cross and the arrow in red, but I would use the green colour for the Past Perfect cross. I think that would personally find it clearer. I very much agree with you on the reason for putting the instructions on worksheets, they are definitely for teachers and not for the learners. Theoretically, we could write two worksheets, a teacher version and a student version. The student-worksheet would be with no instructions as they would given in class by the teacher. A couple of years ago I bumped into an oldish (1997) Italian coursebook that is now out of print but which was ground-breaking when it came out. Well, the student book had no instructions whatsoever and would have been unusable without the teacher book. Was that a trick to force teachers into buying two books? Or was it a decision based on pedagogical principles? I would opt for the latter since it was self-published by the International House in Rome and was written by its own teachers. On a related note, if you have watched Jason Renshaw’s masterclasses on materials design, at 6:15 of this video (https://www.youtube.com/watch?v=d9dHOFoVhb4) he talks about his dislike for stating the obvious and for putting self-evident rubrics on his worksheets (e.g. read the following text). Thanks for your comments and feedback. You make some really useful suggestions about the timeline colours, and raise an interesting question about the mind map at the start. With a class where I had previously looked at mind mapping and visual notebooks I certainly wouldn’t include the framework, as it’s significantly more memorable and personalised if learners create their own. However, with a new or cover class I think the framework can be a useful starting point – so long as learners are clear that it’s only a suggestion, otherwise it could be intimidating to think they have to fill out and extend every area. You make a good point about creating two worksheets. My hard drive of materials and resources I’ve created in the past include a lot of instruction free worksheets and some accompanying scanned hand-written notes of a rough lesson plan or ideas for activities, and this format seems to work best for me. 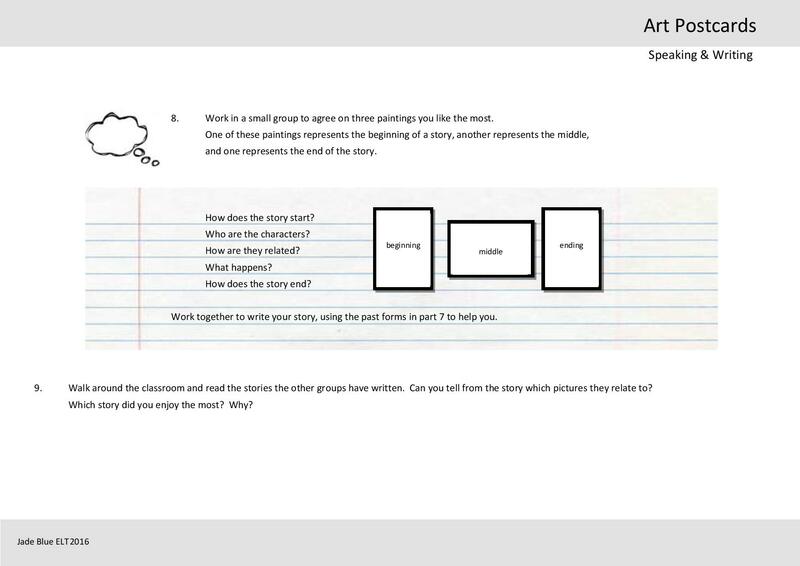 What to do with the material does (and should) change so much from group to group so instructions can quickly become redundant, as well as leaving less space for the learner to make their own notes. Renshaw makes an interesting point, and I’ve just identified one of the things about including instructions on worksheets that has always felt so awkward for me: instructions can seem so patronising and controlling.